The Skywalk was opened on Wednesday 21st March 2018 by Star Wars actor Mark Hamill, AKA Luke Skywalker. It is Gibraltar’s newest attraction and not for the faint hearted! 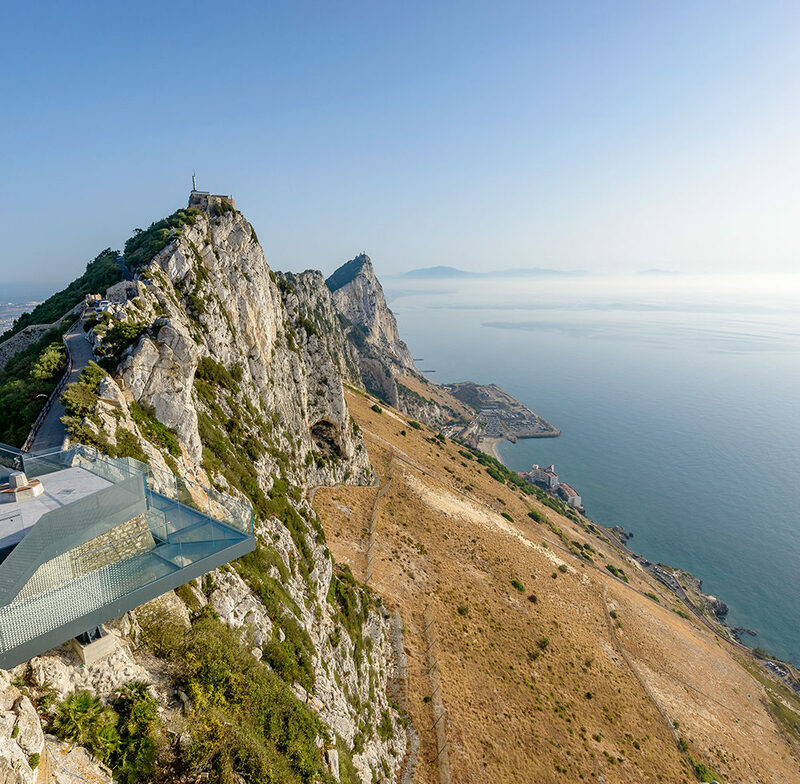 Located at a former military lookout point, the glass platform protrudes out from the edge of the cliff over the Jurassic dune below and overlooks the Mediterranean. A Walkers Ticket or Nature Reserve ticket is required to visit the Skywalk. 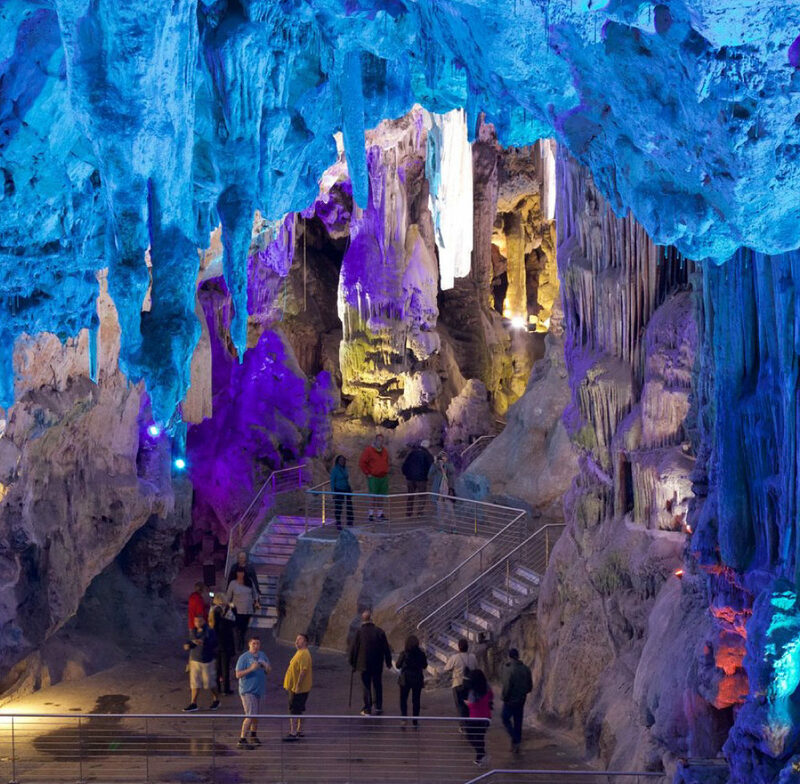 THIS AMAZING, NATURAL, PHENOMENON HAS THOUSANDS OF VISITORS A YEAR WANDERING THROUGH ITS HUGE CAVERN. Thought to be bottomless and first mentioned in the writings of Roman travel writer Pomponius Melia in 45CE, St Michael’s has seen millions of visitors since then though not all with tourism in mind. For instance, learn about how 500 Spanish soldiers were led to safety by Simon Susarte, the shepherd who knew a secret path into the cave during your visit. Also explore the cave in all its glory, see the stalagmite that eventually got too heavy on one side and literally fell over still lying there after centuries. You can even examine the growth rings, the darker rings occurring during periods of less rain. Wonder at the sight that is the Cathedral cave so called because the mineral formations around the walls resemble the pipes of a cathedral organ. St Michael’s is worth the walk the temperature inside remains constant all year round and drips no matter how long it has been since our last rainfall. In fact, if you look carefully at the floor, you will see the beginnings of those stalagmites that in 1000 years might just be knee high to a grasshopper. For the more adventurous amongst you and with those with a little more time on their hands why not explore Lower St Michael’s Cave. Discovered while opening an alternative entrance to the cave during WWII, this cave is also open to visitors but strictly by appointment only. An experienced guide is needed to guide you as you climb, slide and explore deep into the cave. One of the many highlights is a walk around the 5cm rim of a small lagoon! Truly an experience that you will talk about long after your return home. A Walkers Ticket or Nature Reserve ticket is required to access St Michael’s Cave. A Lower St Michael’s Tour with guide, has a separate fee and can be arranged by emailing calypsotours@mhbland.com. If you are looking for a thrill and a great photo opportunity, do not miss out on the Windsor Suspension Bridge. Located just above Apes Den on the Royal Anglican Way and spanning 70 metres, (just over 7 London double decker buses) over a deep ravine the spectacular Windsor Suspension Bridge is well worth the effort. 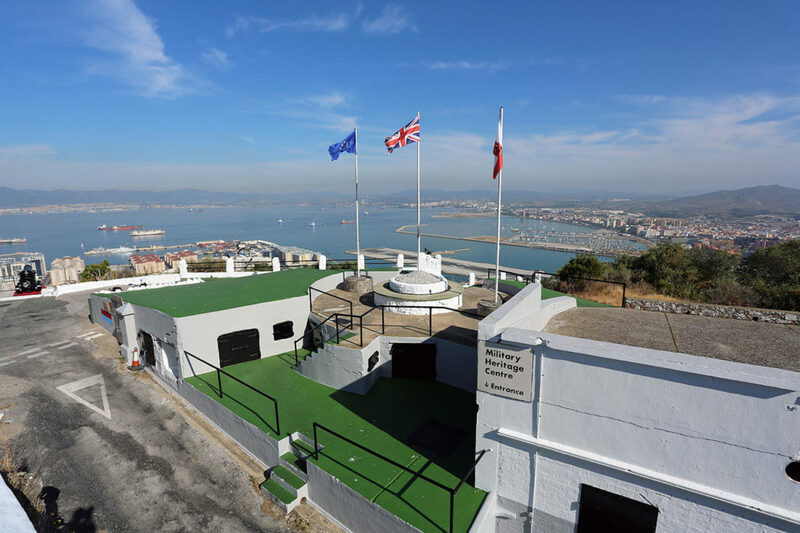 Surrounded by local and World War II history, and overlooking the town and Bay of Gibraltar, you will not be disappointed. The Rock’s formidable highpoint and protector of the Strait still topped by a WWII Gun. 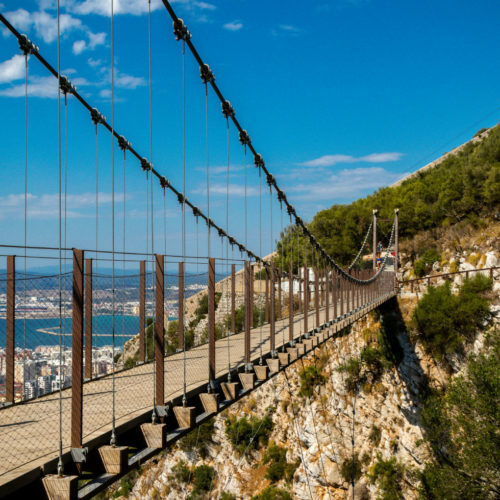 If you rode the Cable Car to the top and decided to walk down towards St Michael’s Cave, then about halfway down you will see a fork in the road that leads to O’Hara’s Battery. The path is a little steep but well worth it if you are into your military history. Named after Governor General Charles O’Hara there was originally a lookout tower at the point, we now call O’Hara’s Battery. The Governor believed if such a tower was built it would enable the Garrison to see Cadiz and any ships heading towards Gibraltar. After it was built, and his theory was dashed, it became known as O’Hara’s Folly. The battery is the highest point of Gibraltar at 426 metres (1400ft approx.). It is also the summit of the Mediterranean Steps, before the walk back downhill past St Michael’s Cave and on to the Ape’s Den. Alternatively, you can purchase a one-way Cable Car ticket from the top station and glide down in just 6 minutes. O’Hara’s tower itself is long gone, being shot down in a bout of target practise by HMS Wasp in 1888 but there still stands a 9.2” gun guarding the straits although it was never or will ever be fired in anger. THE ENTRANCE TO THE NATURE RESERVE IS THE PLACE TO START, IF YOU FEEL LIKE A WALK AROUND THE SOUTHERN AND EASTERN SIDE OF GIBRALTAR. THE VIEWS ARE FANTASTIC, BUT IT IS NOT FOR THE FAINT HEARTED! Under the rules of the above-mentioned article Gibraltar had a problem, what to do with a fairly sizeable Jewish population? The area ‘Jew’s Gate’ is thus named because of the old Jewish cemetery dating back to the 1700’s. The cemetery was placed here specifically away from the prying eyes of any Spanish visitors, so the article was never seen to be broken. The last burial there was in the 1860’s but the cemetery is beautifully maintained to this day. It is now the official entrance into the Nature Reserve through which taxi’s and buses must pass. Next to this is the entrance to the Mediterranean steps, roughly an hour long and strenuous walk through the fauna of Gibraltar that stretches all around the southern end of the Rock snaking upwards towards O’Hara’s battery. 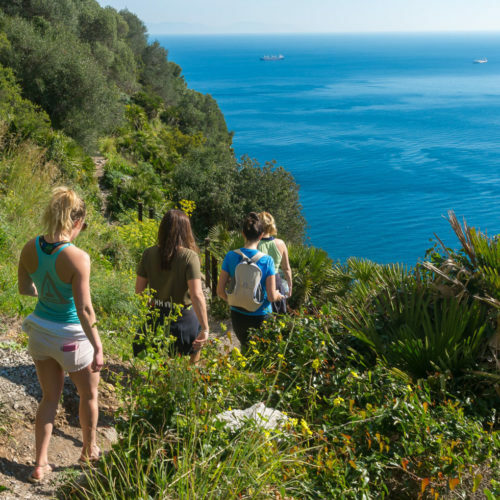 By the end of this walk you will have seen examples of the wild flowers unique to Gibraltar such as Candytuft, Thyme, Chickweed, Campion and Saxifrage. The views of the south and along the eastern side are worth the effort. As the name implies there are a lot of steep steps so if you intend to tackle it in the summer take a floppy hat, sturdy shoes or trainers and plenty of drinking water. A Walkers Ticket or Nature Reserve ticket is required to access the Med Steps. There are various footpaths within the Nature Reserve which allow you to explore the Upper Rock at your pace, surrounded by Nature and History. 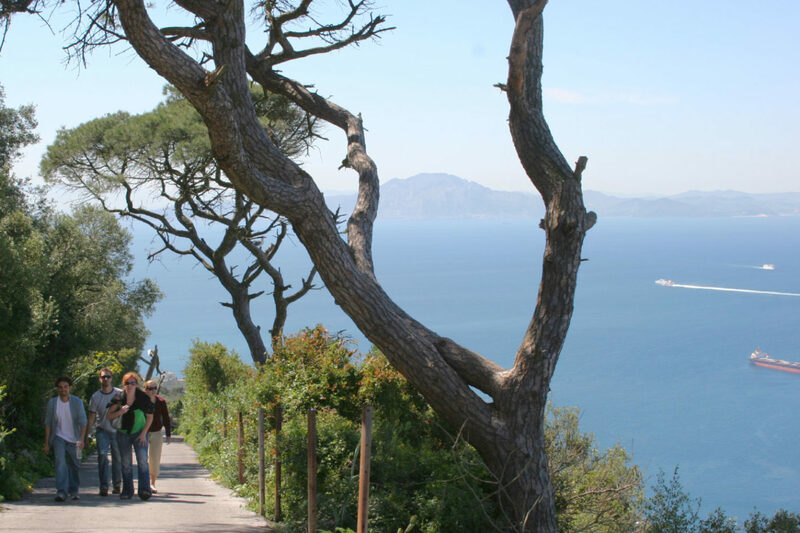 Whether you are a Nature Lover, History Buff or Thrill Seeker there is a walk for you. Alternatively, you can discover and learn more about our famous Barbary Macaques. You will be required to purchase a Walkers Ticket or Nature Reserve Ticket to access the footpaths. 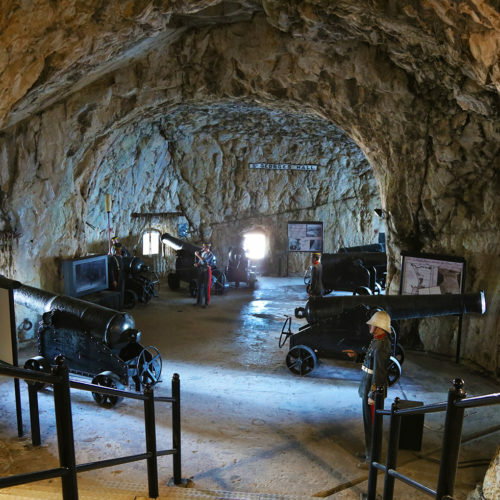 PUT YOURSELF IN THE SHOES OF SOLDIERS MORE THAN 200 YEARS AGO AND EXPERIENCE THE SIEGE TUNNELS NEAR ENOUGH AS THEY WERE WHEN THEY WERE FIRST DUG OUT USING JUST SPADES, CHISELS, HAMMERS AND BLASTING POWDER. 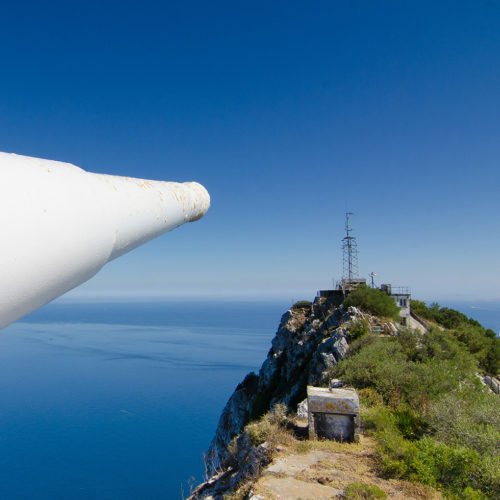 British ingenuity was at its best when during the Great Siege of 1779 – 1783 Governor of Gibraltar General Elliott set a competition and offered $1000 to anyone who could get a cannon on an area on the north face of the Rock called the ‘Notch’. An idea offered by Sgt Major Ince to cut through the limestone rock by hand was taken and the British set to work in 1781. The tunnels were dug using black powder charges, hammers, chisels and shovels. An amazing feat of both engineering and human effort these are a sightseeing opportunity totally unique to Gibraltar. Walking up the steep slope to the entrance of the tunnels gives you some appreciation of the effort of the men who built them, it must have been unimaginable. Even worse, as you walk through the tunnels, is the display case with the rations for the men. The case has a week’s rations that today wouldn’t last a day. Continue the more than 350-foot walk through the 200-year-old galleries and experience life as it was for them. Marvel at the cannons lining the holes looking out across the isthmus to Spain and shudder as you imagine the roar of the cannons firing in such a space. The tunnel is lined with ’embrasures’ a fortification that allows the firer to remain protected as the weapon fires. As you walk along the tunnels you will also see ammunition stores and some of the passageways leading to old WWII tunnels. The tunnels were completed in mid-1783 about 3 months after the Great Siege ended. At the end of the tunnel is St Georges Hall where legend says Lord Napier held a banquet for General Ulysses S. Grant 18th President of the USA. Interestingly for his efforts Ince was given a commission in the Army, a plot of land on the Rock still called Ince’s Farm and the Duke of Kent (Queen Victoria’s father) gave him a ‘fine horse’. There is no mention of the $1000. You will be required to purchase a Nature Reserve Ticket to access the Great Siege Tunnels. SEE WHERE CHURCHILL AND EISENHOWER SAT, THOUGHT UP AND PLANNED OPERATION TORCH – THE INVASION OF NORTH AFRICA. 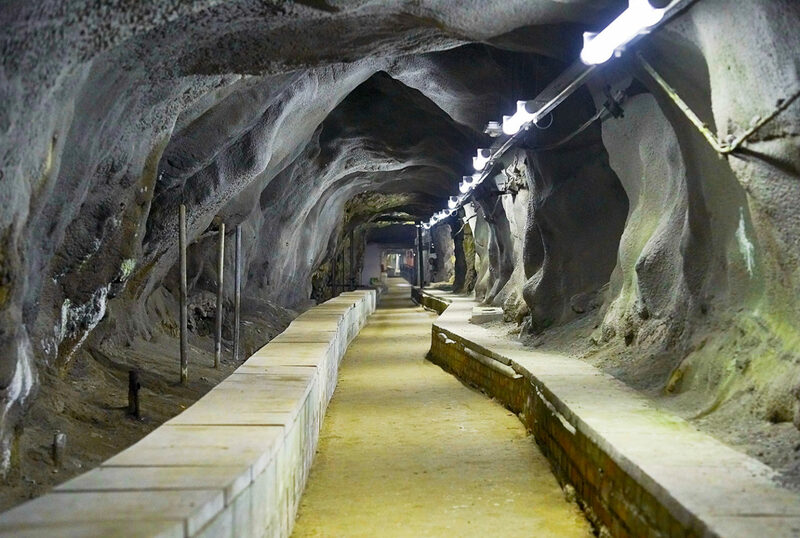 Although the tunnels are located within the Upper Rock Nature a Nature Reserve ticket is required to access the World War II Tunnels. A GREAT VIEWPOINT WITHOUT THE NEED TO CLIMB TO THE SIEGE TUNNELS AND FROM WHERE YOU CAN CLEARLY SEE THE RUNWAY AND THE FRONTIER. Still operating and manned in the early 1980’s this battery has several WWII guns that though now decommissioned still watch over the Bay of Gibraltar. There is a great view of the airfield, the northern part of the city and the border into Spain. The name itself is a misnomer as the battery is really St Anne’s Battery. Princess Caroline’s Battery is located above it and houses the Military Heritage Centre, the road to it is accessed from here and hence the confusion. The guns, now silent, have been recently refurbished and worth a look as a reminder of Gibraltar’s more modern days as a fortress. Really a ‘Tower of Homage’ this ancient building is still one of the most recognised features of the rock with the union flag flying proudly above it. Originally built in the 1160CE the Moorish Castle was ransacked by the Spanish between 1309 – 1333. 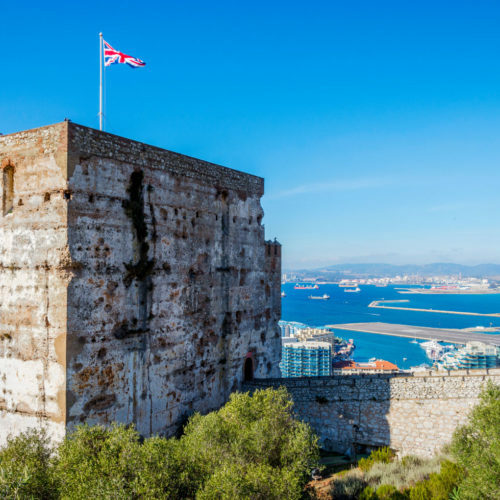 This ‘Tower of Homage’ was rebuilt in the 14th Century by Abu-l-Hasan and today you can visit the inside of the recently restored castle, wonder at those 14th century walls and marvel at the feats of Gibraltar’s first city builders, the Moors. If you look closely you can still see the canon dents in the castle walls. The original city was called Medina Al Fath – ‘City of Victory’ and was walled with defensive towers, dwellings, mosques and a palace for prayer. It also had Moorish baths, you can still see a similar bath within the Gibraltar Museum. A Nature Reserve ticket is required to access the Moorish Castle.